Some grains, such as rice, are available in many different types and varieties. There are thousands of varieties of rice cultivated throughout the world, so even a limited selection in a well-stocked food store may seem overwhelming. Many recipes simply call for white rice or brown rice. Other recipes may require short, medium, or long-grain varieties and still others may instruct the home cook to use a specific variety, such as Arborio for preparing Italian risotto or Valencia for preparing Spanish paella. Becoming familiar with the different classifications and varieties of rice makes the selection process much easier. When selecting rice, it is important to understand the classifications of rice in order to purchase the type or variety of rice that best suited for a particular recipe. Rice is classified according to many different characteristics, such as length, color, region of origin, quality, and texture. All varieties of rice can be categorized using any of these methods of classification. One of the most common methods of classifying rice is by length. The United States is the only country that uses three sizes—short, medium, and long-grain—for classifying the length of rice grains. Other countries classify rice as either short-grain or long-grain. This means that rice varieties classified as medium-grain in the United States are considered short-grain or long-grain (depending on the variety) throughout the remainder of the world. The length of rice is never classified by an absolute length, but by the ratio of the length to the width of the grain. To be classified as short-grain rice, the rice grains must be less than two times longer than the width. Some short grain rice varieties are about as long as they are wide (making them almost round). Short grain rice is usually very starchy, and the grains have a tendency to stick together after being cooked, but rinsing the rice well and using the steaming method to cook it, reduces some of the starchiness. 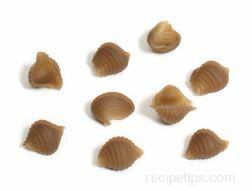 It cooks up tender and soft and is most often used for sushi, risottos, stir-fry recipes, and desserts. To be classified as medium-grain rice, the rice grains must be two to three times longer than the width. Medium-grain rice is less sticky than short-grain rice when cooked, but it tends to clump together when cooled. It holds plenty of moisture when it is cooked, and it remains a bit firmer than short-grain. To be classified as long grain rice, the rice grains must be at least three times longer than the width, and many varieties are often four to five times longer than they are wide. Long-grain rice usually cooks up fluffy and does not stick together after it is cooked. Boiling and baking are excellent cooking methods for long-grain rice, which is the most common type of rice cultivated and used in the United States. Rice can also be classified by color: brown or white. Brown rice consists of the entire kernel minus the hull, while white rice is the result of processing the rice grains to completely remove the bran layers. All unprocessed rice is a shade of brown, varying from dark yellow to red to deep brown or black, depending on the color of the bran and how much of the bran remains after processing. Occasionally, brown rice contains some green-colored kernels, which are kernels that have not completely ripened. When the bran is completely removed from the inner kernel, the color of the rice is white or off-white. The kernels have a polished appearance and a milder flavor than brown rice, but lack the nutrients that are lost due to the removal of the bran and the germ. White rice is often enriched with nutrients (especially in Western nations), such as iron, niacin, thiamin, and riboflavin, to help restore some of the lost nutritional value. Some varieties of white rice may also be infused with coloring agents during processing, such as chlorophyll, which is added to bamboo rice, giving it a distinctive green color. Rice may be grouped or classified according to the area or country in which the rice is cultivated or used. Although many countries export rice to other areas of the world, the majority of rice is used in the area where it is grown. This is especially true in Asia where rice is such an important part of the diet. In the United States, over half of the rice crop is exported, but most of the rice consumed by Americans is American grown. Rice is also classified by the quality of the grains, usually according to the quantity of broken grains that are included in the batch. Four categories are most often used: "Top Quality," "Standard," "Household," and "Broken." "Top Quality Rice" refers to rice in which the quantity of broken grains is no more than 5 percent of the total. The category, "Standard Rice" refers to a maximum of 15 percent broken grains. A maximum of 25 percent broken grains in the batch. A maximum of 40 percent broken grains in the batch. "Broken Rice" refers to an undesirable category of rice in which more than 40 percent of the grains are broken. The rice of this quality classification is useful for making rice flour. The texture of rice after cooking may range from very sticky and soft to very firm and fluffy. Sticky rice is often referred to as glutinous rice. In spite of the name, glutinous rice contains no gluten, but some varieties have gluten-like properties, because they become sticky when cooked, which is beneficial for the creation of certain dishes, such as sushi and a variety of dessert items. 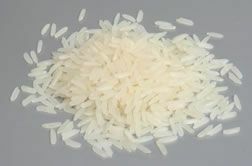 The degree of stickiness of cooked rice is related to the proportion of amylose and amylopectin, which are the two types of starch found in rice. Sticky rice varieties, which are very popular in Asia, contain a higher level of amylopectin. 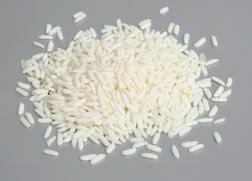 Firm non-glutinous rice varieties, which are favored in the United States, contain a higher level of amylose, a hard, opaque starch that does not readily dissolve during the cooking process. According to the length-width ratio used for classifying rice grains, some of the short-grain rice varieties described here are actually considered medium-grain varieties in the United States; however, some of these varieties are included here, because they are universally referred to as short-grain rice in famous recipes (risotto and paella, for example) by cooks and food experts in all parts of the world, including the United States. Arborio rice, which is named after a town in northwest Italy, is one of the most popular rice varieties used for risotto, a creamy Italian rice dish. 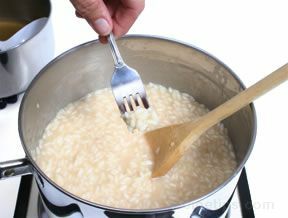 When making risotto, the rice is sautéed in butter and onions and is then cooked in stock, which is added to the rice in small portions to allow the rice to absorb the liquid gradually. The rice is stirred constantly, releasing the starch in the rice, which acts as a thickener and results in a very creamy dish that is finished with the addition of grated hard cheese and butter. Like other Italian rice varieties, Arborio contains more starch than many other types of rice. The starch is an important component for creating creamy dishes, such as risotto, so it is important not to rinse the rice before cooking. Rinsing will wash away much of this beneficial starch. 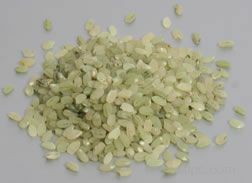 Besides risotto, Arborio rice is used in dishes such as stir-fried rice, sushi, pudding, and recipes in which rice is molded into shapes. Bahia is another popular short-grain rice from Spain that like Bomba, is often used for Spanish paella recipes. Baldo rice is used in much the same way as Arborio for creating risotto, which is a creamy Italian rice dish. The grains are stickier than other popular varieties of rice that are often used for risotto, such as Arborio, carnaroli, and vialone nano. Limited quantities of baldo rice are now being cultivated in the United States. Bamboo rice is an aromatic short-grain white rice from China, which has been infused with the chlorophyll taken from young bamboo plants. As the rice is milled, the chlorophyll is added, making the rice high in vitamin B. Bamboo rice can be served as a risotto, a sushi rice, a side dish with fish or pork, or as an ingredient in rice desserts. 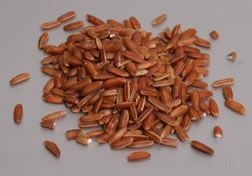 Bhutanese red rice is a short-grain variety of rice grown in the Himalayan Mountains. The kernels have a distinctive brown and ivory color. When cooked, the rice has a nutty flavor that may overpower less flavorful ingredients. Bomba rice is a Spanish short-grain rice that when cooked, expands in width, which differs from most rice varieties that expand in length. It has the ability to absorb three times its volume in liquid, so it's one of the best rice varieties for the preparation of the popular Spanish dish, paella. 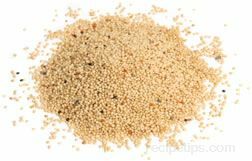 When cooked, the grains remain separate and do not stick together. 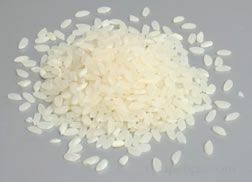 Because of the care required in cultivation and the length of time required for the rice to mature, Bomba rice is expensive compared to other types of short-grain rice. 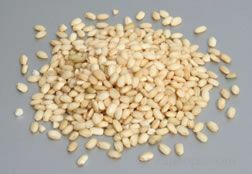 Carnaroli is a type of short-grained Italian rice featuring grains that are small and plump, a high quantity of starch, and a creamy texture when cooked. It is much like Arborio rice; both can be used in many of the same types of dishes. Because it retains its shape as it absorbs liquid during cooking, it is well suited for preparing the Italian rice dish, risotto. Carnaroli is the rice variety that is most often preferred for risotto even though it is more expensive than other varieties. 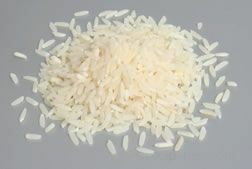 Since Italian rice varieties contain more starch than other types of rice, it is important not to rinse the rice before or after cooking, because the starch is an important component for many of the dishes made with carnaroli (such as risotto). Mochi is a short-grained Asian rice that has a sticky texture. 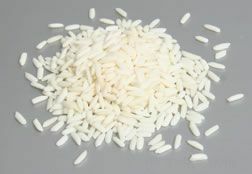 The high starch content of the rice makes it suitable for preparing foods requiring rice that is packed together so that it can be formed into various shapes, such as for rice cakes or sushi. Mochi rice is often milled into flour known as mochiko flour. Nishiki rice is a variety of short-grain rice that is one of the best for the production of sake, which is the popular Japanese rice wine. The grains are a bit larger than other short-grain varieties, and the rice does not contain as much protein or fat, which is beneficial when producing sake. Pearl rice is a short-grain rice variety that is sticky when it is cooked. There are numerous varieties used for sushi or desserts. Pearl rice is also referred to as sweet rice, botan, Chinese sweet, glutinous, Japanese, mochi, sticky, or waxy rice. Roma is a short-grain variety of Italian rice that is excellent for the preparation of risotto. The rice has the ability to absorb a large volume of liquid, and the grains remain separate and distinct when cooked. Roma rice is also used for creamy desserts, such as a variety of rice puddings. The grains of Japanese sushi rice are sticky when cooked making them easy to form into a shape for popular Japanese sushi dishes. There are several varieties of sushi rice and most are readily available. Sweet rice is a type of short-grain rice that sticks together when it is cooked. There are numerous varieties used for home cooking, as well as for commercial product formulations, converting the rice starch and flour into food binders for fillings, gravies, and sauces. The starch and flour do not separate in foods when they are frozen or thawed, making them an excellent option for frozen food products. When used for home cooking, sweet rice can be served with sushi, or it can be served as a dessert rice. Sweet rice is also referred to as botan, Chinese sweet, glutinous, Japanese, mochi, pearl, sticky, or waxy rice. 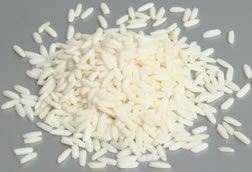 Vialone nano is a white short-grain rice from the Veneto region of Italy. The grains of vialone nano (nano means "dwarf") are short and round. 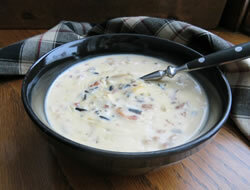 It has a creamy consistency when cooked mostly because of the high starch content of the rice. Since Italian rice varieties contain more starch than other types of rice, it is important not to rinse the rice before cooking in order to retain the beneficial starch. This is very important for the creation of dishes such as risotto, which must have a high level of starch to be successfully prepared. The following rice varieties are a representation of some of the varieties classified as medium-grain in the United States; however, they are classified as either short-grain or long-grain throughout the remainder of the world. Black Japonica® is a brand name for a spicy, aromatic rice blend that was developed in the United States. It is a combination of an Asian black short-grain rice and a medium-grain mahogany rice that were grown together in the same field. Black Japonica® was developed by the Lundberg Family Farms of California. Chinese black rice is a medium-grain variety of rice from China that has a covering of black bran. When cooked, the rice has a distinctive nutty flavor, a slightly chewy texture, and a color that becomes dark purple. Chinese black rice is also known as Emperor's rice and Forbidden rice, because at one time, it was the exclusive rice of the Chinese emperors. Indonesian red rice is a type medium-grain variety of rice that is cultivated primarily in Indonesia, hence the name. When the rice is processed, flecks of red bran are left on the kernel so that some of the white kernel shows through. Indonesian red rice is just one of many varieties of medium-grain red rice grown throughout the world. Italian black rice is a medium-grain variety of rice cultivated in Italy that is characterized by its black, charcoal, and rust colored grains. When cooked, the rice has a distinctive nutty flavor and a slightly chewy texture. It makes an excellent side dish when dressed with oil or butter, seasoned with salt and pepper, and topped with grated hard cheese. 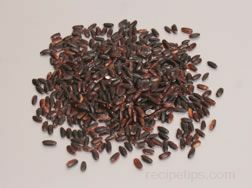 Thai red rice a medium-grain variety of rice that is cultivated primarily in Thailand, hence the name. The rice is sold with much of the red bran covering the kernel so that only a hint of the white kernel is revealed. Like Indonesian red rice, Thai red rice is just one of many varieties of medium-grain red rice grown throughout the world. Valencia rice is medium-grain rice variety that is cultivated in many areas of Spain, but takes its name from the province and city of Valencia, which is the largest rice growing region of Spain. It is slightly sticky when cooked; yet the grains separate easily, which makes it perfect for the popular Spanish paella dishes that originated in Valencia. It is the type of rice most sought after for making paella. Venus black rice is a type of medium-grain Italian rice that is known for its natural black and rust colored grains and its pleasing aroma. The aroma is more noticeable when the rice is cooking and is similar to the smell of baked bread. The origin of Venus black rice came about by the crossbreeding of various types of Italian rice and Chinese rice. It is often called "nobleman's rice" or "emperor's rice," which was a common reference to black colored rice varieties that were eaten by the emperors of China. 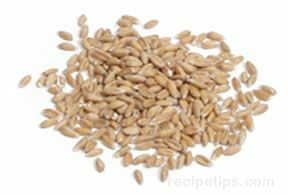 It is loaded with protein and minerals, which are retained in the grains after processing because of the careful methods used in removing the husks. Venus black rice is excellent as an ingredient in soups, when blended with vegetables, or when served as a simple side dish. All of the rice varieties described below are universally referred to as long-grain varieties. Basmati is a long-grain rice that is approximately four times longer than it is wide. It is one of the most popular long-grain rice varieties because of the pleasing fragrance, flavor, and texture of the rice. Much of the basmati rice sold throughout the world is cultivated in India and Pakistan. The rice is fluffy and dry, and the grains do not stick together after it is cooked. Steaming, boiling, and baking are excellent preparation methods for basmati rice, which can be used in pilafs, salads, and a variety of cooked dishes. Basmati rice combines well with sauces and curries. Basmati is one of the most common varieties of long-grain rice found in large food stores throughout the United States. Carolina® is a brand name for a long-grain rice that is approximately four times longer than it is wide. It is one of the most popular varieties in the United States and was first planted in the Carolinas during the 17th Century. It is now cultivated mostly in Arkansas, Texas, and California. Carolina® rice is fluffy and dry when cooked, and the grains do not stick together. Steaming and baking are excellent cooking methods for Carolina® rice, which can be used in pilafs, salads, and a variety of cooked dishes. 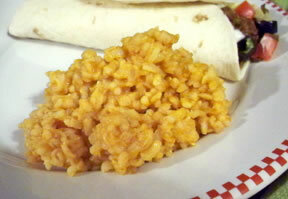 Carolina® rice is also known as patna rice. 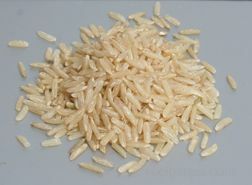 Carolina rice is one of the most common varieties of long-grain rice found in large food stores, especially in the South. 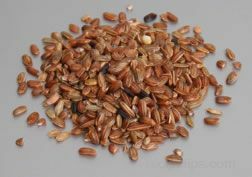 Himalayan red rice is a long-grain variety of rice featuring bran with a red color. It is cultivated in Nepal. It has a rich, nutty flavor and a deep red color when cooked. 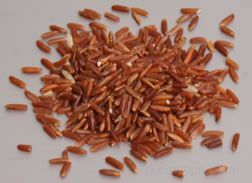 It is one of many types of long-grain red rice grown throughout the world. Himalayan red rice has a firm texture that makes it a good choice for salads and various pilaf recipes. Indian red rice is a long-grain variety of rice with a red bran covering (actually, reddish-brown). It is cultivated in India, has a nutty flavor, and is usually not milled, leaving the bran intact. Red rice from India is one of many types of long-grain red rice grown throughout the world. 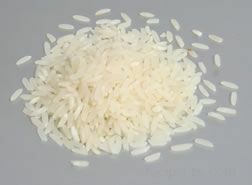 Jasmine rice is a variety of long-grain rice cultivated in Thailand. It is very fragrant and when it's cooked it is slightly sticky but very flavorful. It is often used for traditional Southeast Asian dishes. It is also known as Thai Fragrant Rice, a name that refers to the jasmine fragrance. 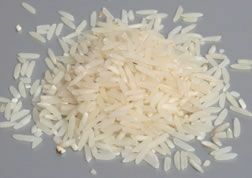 Jasmine rice is available in both white and brown varieties. Although fragrant and delicious, the white variety does not compete with the other ingredients in a dish. The brown variety contains the bran, which provides more nutrition and fiber, but it requires additional cooking time. Kasmati is a long-grain variety of aromatic rice developed in the United States. It is considered to be similar to Basmati rice in taste and texture. Kasmati rice is most often served in Indian and Middle Eastern food dishes. Pecan rice is a hybrid of basmati rice. It is an aromatic rice that is grown primarily in the southern United States. It is available in white or brown varieties and when cooked, provides a rich, nutty flavor with a popcorn aroma. Surinam is a flavorful long-grain rice variety from South America. The grains are unusually long and thin. It is highly sought after for its flavor, texture, and appearance. It is often quite difficult to find in the United States. 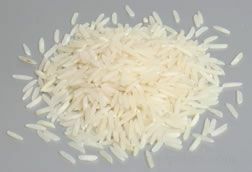 Texmati® is a variety of Della rice, which is a cross between basmati and other long-grain rice varieties grown primarily in the southern United States. When it is cooked, it expands widthwise, but maintains the same length. It is not as aromatic as basmati rice, but is more flavorful and aromatic than other long-grain rice from the United States. It is a fluffy dry rice that doesn't stick together after it's cooked. Steaming and baking are excellent preparation methods for Texmati® rice, which can be used in pilafs, salads, and a variety of cooked dishes. Texmati® rice is commonly available in most large food stores. Thai black rice is a long-grain rice variety that is cultivated in Thailand. It is actually a form of sticky rice, but because the black bran layers are not removed from the rice during processing, the rice does not stick together when cooked. 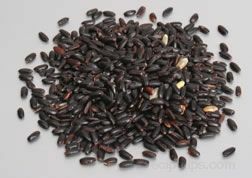 Thai black rice has a sweet, nutty flavor, and like other varieties of black rice, it develops a purple color when cooked. In Thailand, it is usually not eaten as part of the main meal, but is instead sweetened with sugar and coconut milk and used as a dessert or snack. It is very filling, so it is usually eaten in small quantities. Wehani® is a brand name for a domestic aromatic long-grain rice that is generally sold as an unpolished or brown variety. When cooked, the rice opens and splits similar to wild rice. The flavor is slightly sweet and nutty with a popcorn-like aroma. Wehani® rice was developed by the Lundberg Family Farms of California. 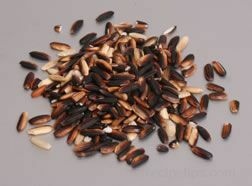 Although wild rice is not technically a type of rice, it is used as one. True lake rice is manually harvested, making it quite expensive. Wild rice grains harvested from the lakes of Minnesota are of varying lengths and colors and usually vary from one body of water to another. 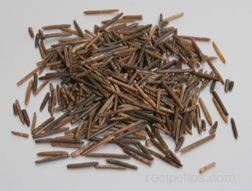 The grains of Canadian wild rice tend to be longer and are often referred to as jumbo Canadian wild rice. Cultivated wild rice (the type most commonly found in food stores) is less expensive, but it is grown in controlled paddies. The fact that much of the wild rice sold in the United States is actually cultivated in controlled paddies, doesn't mean that the quality is better than true wild rice. Most of the cultivated wild rice in California is parboiled so that it cooks faster, but some of the flavor and nutrients are lost because of this convenience. rice are giant extra fancy, medium extra fancy, and select. 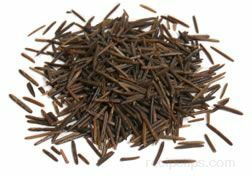 Wild rice graded giant extra fancy, is a long-grain variety that is the most expensive and is generally used for special dishes in which the flavor and the appearance of the grains are very important criteria. 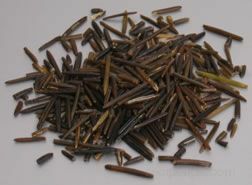 The grains of giant extra fancy wild rice are nearly one inch in length and are of a uniform size and quality. 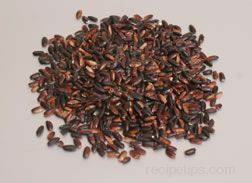 The grains of medium extra fancy wild rice are about half the length of the giant variety, but they are of uniform size and are less expensive. 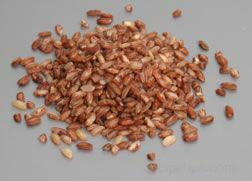 This medium-grain variety is the most popular type of cultivated wild rice and is used for most dishes that require wild rice as an ingredient, such as soups, salads, stuffing, or simply as a side dish. 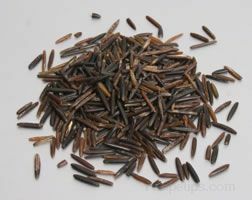 Select is a short-grain variety of wild rice that is generally used in combination with other ingredients, because the appearance of the rice grains is of secondary importance. 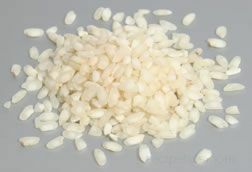 The rice grains are usually not all the same size; in fact, some may be broken, which make this variety very suitable for baked goods, soups, and stuffing.